We are collecting handmade scarves for families in shelters in New Haven. You can use your own yarn and then drop off your scarves in our store. Or if you need yarn, please stop by -- we have lots of donated yarn to use! Please stop by or call the store at 203-248-9449 for more details. 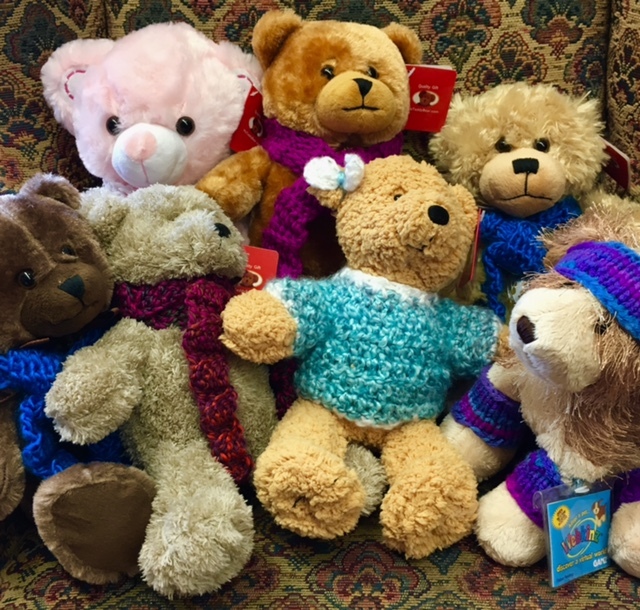 Books & Company, along with our generous customers, have covered the cost of these brand-new bears. Customer friends have lovingly hand-crafted scarves to dress up the bears, making each one unique. In the past year, more than 400 bears have been distributed to children in need through local organizations such as Ronald McDonald House and IRIS, as well as the Hamden Police Department. The Preemie Hat Project has provided more than 100 hats to Yale New Haven Hospital Neo-Natal Intensive Care Unit (NICU), hand crafted by our customers & staff. for incubators in the NICU. Watch for more details coming soon!